This post is sponsored by FitFluential LLC on behalf of the The Cherry Marketing Institute. Over the past few days, I’ve mentioned my participation in the 7-Day Tart Cherry Juice Challenge, but I have not explained the finer details of this challenge. The main reason for this is that I’m well aware of placebo effects when completing health challenges like this. And like my morning shot of cherry juice, I gave the challenge a moment of attention and then moved on, letting the effects play out as they will. So what is the reason for drinking tart cherry juice or concentrate? One reason is I have just started a new marathon training cycle. For the next 17 weeks, I will be completing a lot of strenuous running workouts including speed work, hill intervals, and long runs. In between those, the CrossFit training is extremely important to keep my IT band happy and increase overall flexibility and endurance. What do cherries have to do with my workouts? Reduced muscle soreness. In two studies, runners who drank Tart cherry juice before and after strenuous races reported a reduction in muscle pain. In a separate study, experienced cyclists drank tart cherry juice twice a day for 7 days before a 3 day race. These 16 cyclists reported similar results as the runners. Both of these case results were compared to a control group who drank a different beverage. Faster Recovery. In the studies noted above, another benefit reported was faster recovery after a strenuous event such as a race. I’m very interested in recovery because it seems I take longer to recover from weekend long runs. I have to wonder if more water alone is the answer or is there something in tart cherries that could aid in recovery. Check this link for information on all these studies. Researchers suggest the compound anthocyanin found in Montmorency tart cherries, is responsible for the reduction in inflammation, muscle damage, and oxidative stress usually present in athletes after strenuous activities and events. Additional research is needed to explain the anti-inflammatory effects of drinking tart cherry juice but these studies are promising. I am going to continue with the juice challenge since running was put on hold last week due to illness. I look forward to seeing the results. 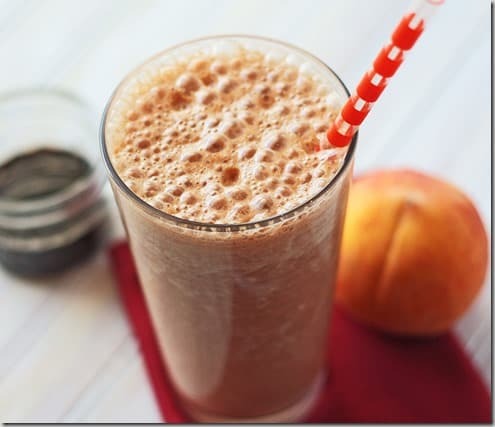 Here is an easy recipe using Tart cherry juice. 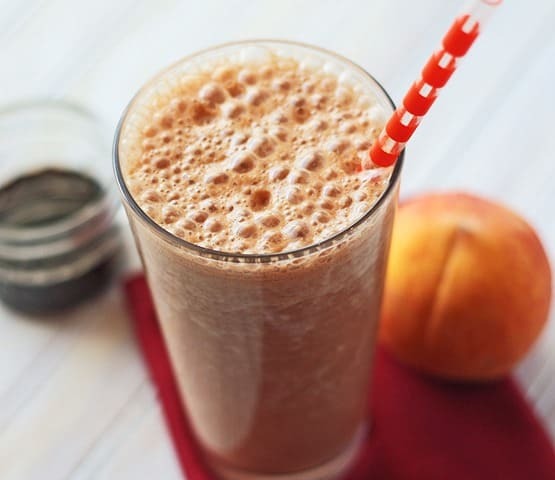 Since peaches are in season and Alabama happens to have some of the best peaches in the country grown in Chilton County, I made this smoothie. Down here, we love our cobblers and pies in the summer when fruit is plentiful and ripe. One of the most common pies for summer is a cherry peach pie. 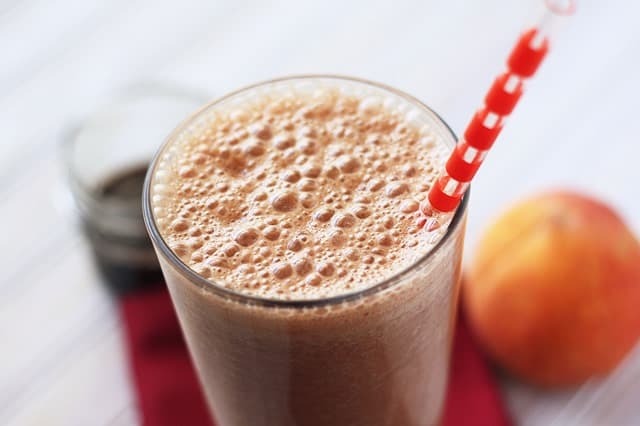 I used the flavors of this Southern favorite in an easy-to-make smoothie. 8 oz Tart cherry juice. Peel and cut peaches into large pieces. Add to a blender. Add yogurt, juice and spice. Blend until desired consistency. Serve immediately. Makes 1 large smoothie. For more information about the 7-Day Tart Cherry Juice Challenge, and The Cherry Marketing Institute, check out the following links. Previous Post: « I just have 1 thing to say..
cherry peach pie?! sounds like a fabulous combination! Love the combination! Peaches and cherries are so yummy together!